Interesting Facts: Espeon are very loyal to their trainers and will protect them from harm. They enjoy basking in full sunlight. They are also able to read air currents allowing it to predict the future as well as its opponents' next moves. It evolves from Eevee via Happiness during the day, or when around a Sun Shard. As a shiny, its fur is a desirable bright-green. NOTES: The minee-veelutions have turned into a mini-series! Enjoy glaceon, whose biggest complaint is in the small, dainty paws. Hey man, I SAW YOU UPDATE IT! I wad going through my favourite sites and the new thing just came up! THANKYOU p.s. I'm Australian so it's the 6th of March over there but here it's the 7th. It was my Birthday yesterday and I got Pokémon Black 1(So far I just beat Burgh) and I also got the entire 14th series of Pokémon Black and White!!! Congrats for the new model! 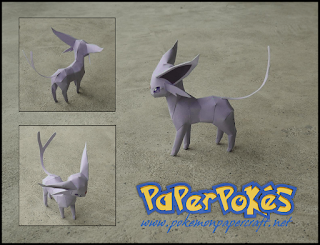 Does most of the Paperpokes team play actually Pokemon? It seems like a lot of the visitors on this site haven't played Pokemon at all. I just got back from States for the TCG, actually. All of us at least play the DS games, but I think I might be the only one who plays the TCG as well. It says Bruneary on the Gen 4 page. btw Please do a Braviary. I used to do TCG all the time but now im just on my 3DS, soo out of curiosity are you guys planning on making chespin, fenniken, or froakie anytime soon? Print it A3 or split into two A4 pages and... shazan!! It will be 13cm tall and pretty. With little skill you can make it any size, but the details wont be so nice, because it's supposed to be mini. Well done for the new craft-sitting next to Big Espeon as I write this. I actually say the website change as I was viewing it from my favourites. It actually changed and I was like "OMG!" for some reason i can't see the picture ,but i bet its great! !